The Cold Steel 89VA Tomahawk is a large sized tool that is great for getting bigger jobs done with ease. At 52 inches in length, this tomahawk will surely satisfy the need for a large tool and wide, sharp blade. The blade on the 89VA Tomahawk is 9 5/8 inches, making it one if the larger blade widths available in this tomahawk style. The edge length is a whopping 10 1/3 inches, one of the longer edge lengths of tomahawks. The handle of this tomahawk is made from American hickory wood, and has a natural wood finish. The blade is silver in color, allowing it a traditional look and feel. The total weight of the tool is 4 pounds 10 ounces, making it one of the heavier products in the tomahawk market. This tomahawk is made in Taiwan, and is of great quality and craftsmanship. 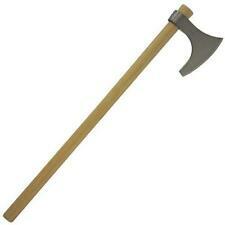 It is of the more expensive tomahawks, but it sure does deliver in quality and in its variety of use. This tool has received a 4 out of 5 rating, ensuring that it is satisfying to a large customer base. This is a great tomahawk for those who want a tool that is heavy-duty, for all of your outdoor needs. 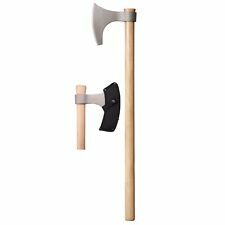 This tomahawk can chop wood easily, and requires less effort because of its large blade and edge length. The Cold Steel 89VA Tomahawk is a great tool to have for all of your large projects. It will remain sharp, as the forged carbon steel blade keeps its edge well throughout uses. The handle is comfortable, and will make use easy despite the heavier weight of this tomahawk. Do you own or have you used the Cold Steel Viking Axe? If so, rate it! Have you or someone you know purchased or used the Cold Steel Viking Axe? How did it work? Share with the community!